Like many of the cast members of Orange Is The New Black, Uzo Aduba was mostly an unknown when the Netflix series burst onto the scene last year. 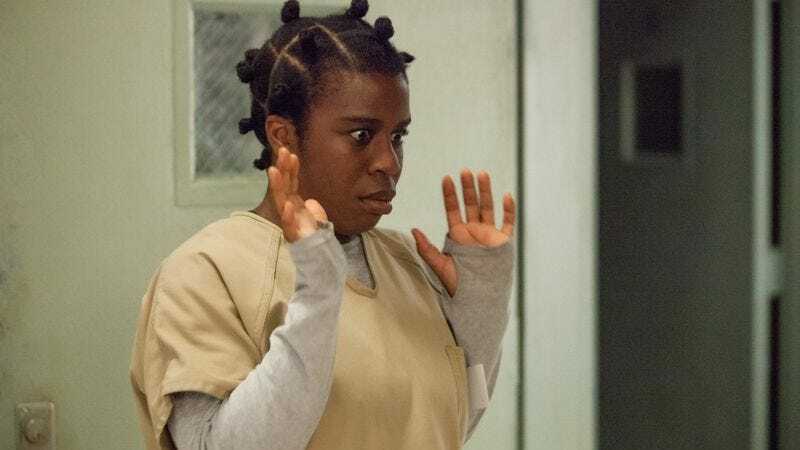 Yet as more and more people consumed the women’s prison dramedy, Aduba’s work as Suzanne “Crazy Eyes” Warren received notice from numerous corners, both critical and otherwise. The praise for her work has only intensified with the recent release of season two of the show, which adds Aduba to the show’s regular cast and delves into the complicated, tragic backstory of Suzanne. 1. Who is the most famous person you’ve ever met? Uzo Aduba: I think it was Queen Latifah. AVC: What was that like? UA: Awesome, because I’m a fan of hers—huge fan. I got to be on her show, and she was everything that I had hoped she would be. She has the most generous and kind and warm spirit. Smart lady, too. AVC: What’s that talk-show experience like? UA: Well, it was the first one I had ever done, so it was amazing to be on a talk show. The audience was so generous, and we were getting to gab and talk and feel very relaxed. I enjoyed the experience. It was really, really, really, really, really fun. And funny, too. 2. What did your parents want you to be when you were growing up? UA: They didn’t necessarily want me to be anything—any of us, my siblings and I. I’m first-generation Nigerian. A lot of people—Nigerians—go into professional, corporate jobs. Medicine, law, corporate, all that. Really, all my mom ever said was that she wanted whatever it is that we did—for us to put our best into it. And to strive for excellence, whatever that is. And to love it. AVC: So, when they found out you were going into acting, how did they feel about that? 3. What’s on your DVR? UA: Turn on AMC. Anything Real Housewives. [Laughs.] Pretty much anything on Bravo is in a backlog—anything—because I have been out of town for a couple weeks now. Pretty much the month of May, I’ve been gone, so anything on Bravo is on my DVR. Turn and OWN—those are on my backlog. Everything else can be found on Netflix. 4. Who would be your pop culture best friend? UA: I’m obsessed with Beyoncé. I think she’s amazing. I think she’s a genius. I think she’s a wonderful performer—an incredible artist as far as her longevity in the business, and what she’s been able to do. I love her. I think she’s great. AVC: What do you think the experience of being Beyoncé’s best friend would be like? 5. What was your first big grown-up purchase? UA: By myself? A trip last year to London. No, to Europe. I went to Amsterdam, London, and Belgium. AVC: What did you do there for fun? UA: I went to go visit one of my best friends from my hometown who was living over there. I also went to go and visit family. It was awesome. 6. What game show would you be good at? UA: Any kind of Cranium-like set up. [Laughs.] If Cranium became a game show, I would be good at that. Or, I’ve watched this show before on the Game Network—have you ever watched the show $100,000 Pyramid? I’m good at that. Family Feud, also. I’m very good at Family Feud. AVC: What section of Cranium is your best? UA: Definitely not the clay. [Laughs.] The charades bit is pretty good. 7. What’s your secret talent? UA: I can whistle through my front teeth. AVC: Do you have any particular tune that you do? UA: No particular tune, but I can do it. I whistle through my gap. UA: “Hold On.” Wilson Phillips. AVC: What makes that a good karaoke song? UA: It’s always good to do it with people. My sister and I, when we go karaoke-ing, it’s always a hit. We love doing it—to sing a duet with somebody. Plus, I just like the words. And we get really into it. [Laughs.] So it’s a fun one. UA: I had a girl who was dirty. She wasn’t messy; she was dirty. Which I think are two different things. AVC: How do you describe that difference? UA: It wasn’t like she left clothes hanging around, it was like, if I went out of town for a couple of weeks, she would not wash the apartment. And that was kind of gross. And the floor would be sticky and just gross. 10. Do you have anybody’s autograph? UA: Yes. I have it in my apartment. I did—on Broadway—the revival of Godspell, and our opening night, the original company and members of the huge tour—the Canadian tour they did that same year—came, and I have Martin Short, Rita Wilson, Victor Garber, Andrea Martin, Eugene Levy. I have a brick that we got as a gift from the people of Godspell. They did this gift, because there’s a song in the show—“Beautiful City”—“brick by brick—we can build a beautiful city.” So, they got us each a brick with the graphic of the artwork for the show on it, and they all came backstage to tell us how much they enjoyed the show. I had it out and I had them each sign it. So I have this great brick, and it’s the new brick from my show, but it’s got all of the old cast members signed on it. Stephen Schwartz signed. It was great. 11. What pop culture would you pass on to the next generation, if you could have a time capsule? UA: Mid- to late ’90s [music]. I love all of that—Sarah McLachlan, India Arie. I love that music, and I feel like we’re returning to it of late. That woman had a voice. AVC: Do you have a favorite song or songs from that era? UA: I love “Galileo,” by Indigo Girls. I mean, I’m obsessed with Sarah McLachlan, and I was going to say Lilith Fair, but I’ve never been. That kind of music—I love it. My sister and I used to ride to school and listen to it in the car. Like, [Adopts a high-pitched voice.] “Galileo.” We’d just be singing along. My older sister loved it, too. Anything from that—I would be into it. It felt like women took charge. Bonus question from Jenny Slate: Who do you think is the most responsible celebrity? UA: I would say Oprah Winfrey, because she uses her powers for good. What question do you want to ask the next interview subject? UA: What else is there left to say about life? AVC: What do you think there is left to say about life? UA: There’s still more holes for us to fill.